Born and raised in Birmingham, Ala., Tracy Luke began working at Samford University in 1989. As the program assistant for the Center for Advocacy and Clinical Education, Mrs. Luke helps students with advocacy classes, externships, Moot Court Board and Trial Advocacy Board activities, and the law school’s national competition teams. In addition, she serves as the point person when Cumberland School of Law hosts regional and national advocacy competitions. She originally joined Samford to work for the School of Pharmacy. She has also worked in the Office of Alumni and Development. In 1991, while in the alumni and development office, Mrs. Luke met Jim Lewis, retired vice dean of Cumberland School of Law, Lewis recruited her to work for the law school. 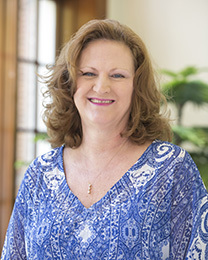 Mrs. Luke earned her bachelor’s degree from Samford University.